This is a very nice small bowl made using a form of glass canework called murrine (pronounced "mu REE nee"). Murrine are formed using a fairly simple process... basically, a bundle of glass rods of whatever colors the artist wants to use are heated, fused together, and then stretched until they form a long cane of glass that is many meters long. (These canes can be recombined with other canes to form very detailed canes.) Once the desired cross section of the cane is achieved, the cane is cut into very small slices; these are the murrine. To create a bowl, the artist lays the murrine on a flat surface, heats them until they fuse together, and then forms the hot glass into a bowl shape. 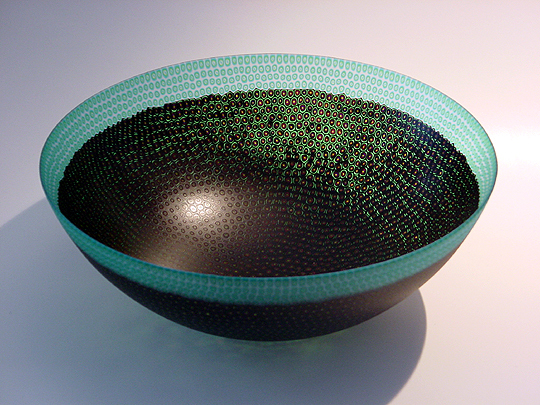 In the case of this work, there are two main colors of murrine... black and teal. The black murrine actually contain a combination of white, black, red, and clear rings of glass; the teal murrine contain teal and clear glass. The shape of the individual murrine varies because they distort somewhat during the fusing process (to fill in all of the gaps between them). There are a few things I really like about this bowl. First, Mel has ground and polished the bowl until it is razor thin... unlike most murrine works I have seen, this work is very delicate. I also really like the combination of colors... black is always a good color (to me, anyway), and the teal rim really contrasts well with the rest of the work. And the shape of the bowl seems ideal to me.